COCHABAMBA (Morning Star News) – Evangelical Christians have begun their battle against new measures that could result in the dissolution of Protestant denominations and other groups that have ministered in Bolivia for decades. As organizations that fail to comply with the new government measures will lose their legal standing, the National Association of Evangelicals of Bolivia (ANDEB) on July 30 presented a Petition of Unconstitutionality to the country’s Constitutional Tribunal seeking their repeal. “This law is totally unconstitutional, incongruent with religious liberty as enshrined in Article 4 of the constitution,” said Cochabamba attorney Ruth Montaño, who helped frame ANDEB’s Petition of Unconstitutionality. The battle over constitutional rights in Bolivia pits the country’s religious minorities against the government of President Evo Morales. The outcome could determine future freedom of religion in the Andean country, particularly for Bolivia’s 1.6 million Protestant Christians. 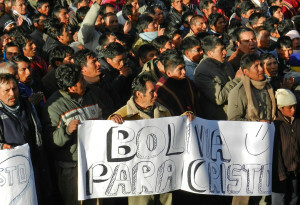 Law 351, passed by the Bolivian legislative assembly in March 2013, aims to “regulate the granting and registration of legal standing to churches, religious groups and spiritual beliefs, whose goals do not involve profit.” Morales signed the second disputed measure, Supreme Decree 1987, on April 30. Setting guidelines for implementation of Law 351, it stipulates that any religious organization in the country – Jewish and Muslim communities as well as Protestant churches – must reapply for legal standing within the next year. Decree 1987 imposes a list of burdensome preconditions upon religious organizations that contradict the language of Article 4. For example, denominations must file a “notarized listing” of the names, ID numbers, tax certificates and police files of national leaders, as well as notarized lists of names and ID numbers of their entire membership. Churches are also to provide a schedule of their annual activities “for control and follow-up” by the Ministry of Foreign Affairs. Failure to produce the required paperwork, or flaws in the reports as determined by the Ministry of Foreign Affairs, will result in the cancellation of the organization’s legal standing. This in turn would lead to confiscation of church properties, dissolution of worship services and closure of training centers, she said. “The threat to revoke the documents that grant us legal standing, simply by decision of a state bureaucrat, violates due process,” Montaño said. Decree 1987 also requires churches, synagogues and mosques to file copies of their bylaws with the Ministry of Foreign Affairs. To gain official approval, these documents must include procedures for “the admission and exclusion of members, the rights and obligations of members, an internal disciplinary regimen which includes infractions, sanctions and procedures,” and other such provisions. ANDEB expects a ruling from the Constitutional Tribunal by the end of the year. If judges decide in favor of religious organizations, the contested regulations would be nullified. This in turn would obligate the legislative assembly to pass a law to guarantee freedom religion and protect the legal standing of churches. ANDEB officials have met with Morales and members of his cabinet on several occasions to register their opposition to Law 351 and Supreme Decree 1987. In a meeting on July 28 with Minister of the Presidency Juan Ramón Quintana, ANDEB President Agustín Aguilera, ANDEB vice-president Romualdo Atahuachi, and ANDEB board member Jorge Chávez protested the new regulations. They told Quintana that the evangelical Christian population had mobilized a prayer movement aimed at defeating their implementation. After listening to the objections raised by ANDEB leaders, Quintana reportedly agreed that they should petition the Constitutional Tribunal for redress, which they did two days later. According to Aguilera, the evangelical Christian community plans a public march in defense of religious liberty in all of Bolivia’s state capitals on Sept. 6. The demonstrations will also alert the public to their appeal before the Constitutional Tribunal. Bolivian officials have sent contradictory messages to the Protestant Christian community throughout the unfolding controversy. In one widely publicized incident, an estimated 10 thousand Quechua- and Aymara-speaking evangelical Christians hosted Morales at their annual Easter morning worship in the village of Chacarillas. After thanking them for their prayers on his behalf, Morales touted his administration’s record on religious liberty. Ten days later, Morales signed Decree 1987, which, if strictly enforced, will close at least some Protestant churches. The irony of his action was not lost on church leaders.